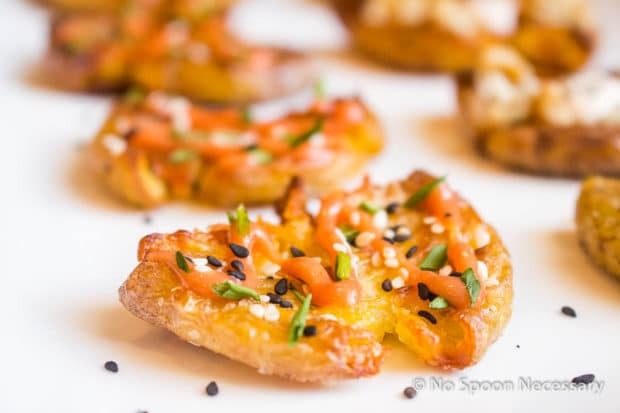 These smashed, golden, crispy little bites of deliciousness are nothing I created or conjured up with my culinary imagination. Sorry, I did not recreate the wheel with these, as they have been popping up all over the internet. As a fan of the potato, especially one with a crispy exterior, I decided making them for a post was necessary. But, I didn’t want to just make them, I wanted to inspector gadget- kitchen test them and find the best method in preparing them for you guys. You see, I found everyone has a different cooking method… some say fry, a bunch say shallow skillet fry, others say bake. For the ‘smashing’ part, recipes use different methods as well: a potato masher, bottom of a glass, your palm, or your fist. Then there is the original cooking of the potatoes, to make them ‘smashable’… boil, bake, roast, steam. Sheesh. Certainly a combination of one of these would provide a perfectly golden brown delicious, crisp of the outside, soft on the inside smashed potato. I decided I wanted to set out and find it! 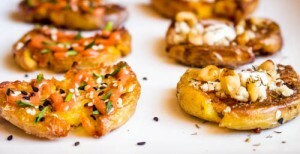 Plus, who really needs an excuse it eat lots of crispy potatoes?? Not this girl!! I found that baking the baby potatoes, covered, produced the best outcome for smashing. That and scoring the top with an X. Also, I swore the potato masher would work best for flattening them. Wrong. Turns out the best was the flat side of a meat mallet, a gentle hand, and a rocking back and forth motion. When it came to cooking these, I actually preferred the taste outcome of the shallow-fry variety. However, they are so delicate, pan frying requires patience when attempting to flip them. Baking them was definitely easier, but they didn’t get quite as crisp. However, they were still very yummy! Therefore, I am providing you with instructions on how to cook BOTH. So here you have it…. 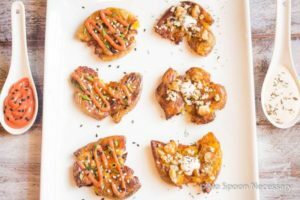 My version of crispy smashed potatoes, through kitchen trial and errors. Oh, and don’t forget the two Sriracha based sauces and accoutrements, sure they would still be delicious dipped in ketchup or fry sauce, but why do that when you can gussy ‘em up??? You shouldn’t. So don’t. :)If you aren’t a huge Sriracha fan, like me, either omit entirely, reduce the amount, or substitute a few splashes of your favorite hot sauce. Hope you Enjoy! Preheat the oven to 450 Degrees F. Make sure one oven rack is in the bottom position, this is where you will bake the potatoes. 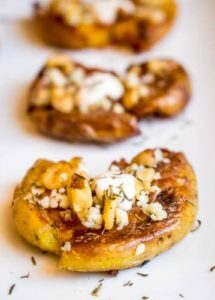 Place potatoes on a sheet pan with a rim. Pour ¾ cup water over the potatoes. Cover tightly with aluminum foil. Bake for 25-30 minutes, or until tender and can be easily pierced. 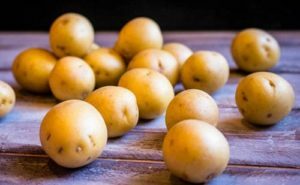 Transfer Potatoes to a Kitchen towel or Colander and let them drain well. Move them to a Dry Towel lined work surface and let cool slightly (you still want them to be warm). 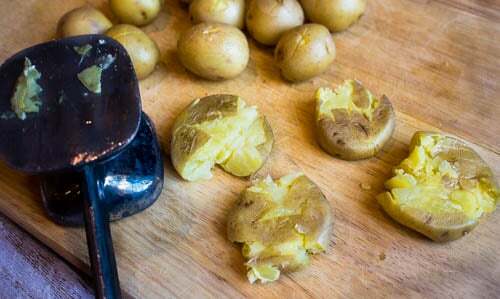 With a paring knife, score a small “X” on the top of each potato. Using a Potato Masher, the smooth side of a meat mallet, the palm of your hand, the bottom of a cup, pan, or measuring cup, gently smash each potato to about ½- ¾ ’’ thickness. You don’t want to pulverize them. You want them to stay whole, just flattened. Transfer the smashed potatoes to a sheet pan to allow them to cool completely at room temperature, covered with a piece of parchment paper. Preheat an oven to 180-200 Degrees F and set a wire rack on top of a baking sheet (you will use this to keep the Potato Bites warm as you work in batches. Heat Extra Virgin Olive Oil in a cast iron skillet (or stainless steel skillet) over medium heat. Fry the Garlic clove to infuse the oil with flavor, about 2-3 minutes. You don’t want to burn the garlic! Transfer garlic infused oil to a bowl or liquid measuring cup (remove the garlic clove with a slotted spoon). Add ½ the infused oil back to the pan. In batches, as to not over-crowd the pan, shallow fry the smashed ‘taters, for 3 minutes. Flip and continue cooking for another 3 minutes, until golden and crispy on both sides. 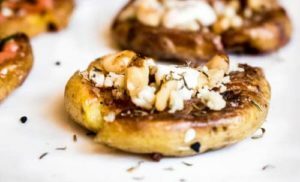 Transfer the golden brown delicious potatoes from the pan onto the wire rack and generously season, while hot, with Sea Salt, Pepper and dried herbs (if using). Place sheet pan in oven to keep warm. Fry the remaining potatoes in the same fashion, adding more oil as necessary. Keep potatoes on the sheet pan, generously season with salt and drizzle with infused olive oil, lifting them to ensure the oil gets underneath the potatoes as well. Roast at 450 degrees F. for 30 – 40 minutes, turning once. Serve immediately topped with below sauces and suggested garnishes. *Mix all ingredients together in a bowl of a food processor, or a small bowl. Cover and place in the refrigerator for at least 30 minutes (8 hours is best), to allow flavors to marry. *Mix all ingredients together in a small mixing bowl and use an immersion blender to pulse ingredients together to desired consistency, or use a food processor. 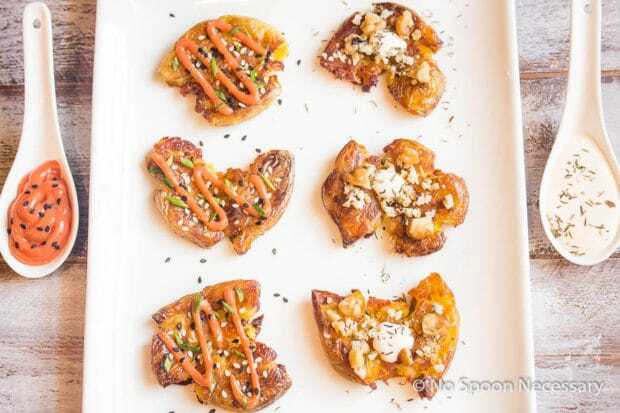 *Cover and place in the refrigerator for at least 30 minutes (8 hours is best), to allow flavors to marry. *Dip or Dollop and Eat Plain. *Top anyway you would a Baked Potato: loaded, with thinly sliced steak and steak sauce… use your imagination! *Dip anyway you would French Fries: plain ketchup, fry sauce, honey mustard, ranch… again imagination! 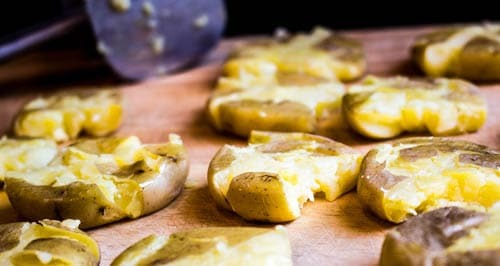 *To partially make ahead: cook and flatten the potatoes. Once they have cooled at room temperature, transfer the covered potatoes to the refrigerator. This can be done up to 8 hours in advance. So you don”t try to shape them at all? Just whatever shape they take on after smashing? They look so good I thought maybe you used some to create a desired shape or 2. 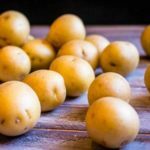 My very favorite FOOD – white potatoes!! Thank you for this, sweet Chey!! Me too!! 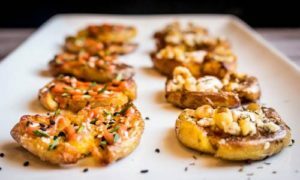 I could eat potatoes at every meal… if I wasn’t worried about needing to move off the couch! 😉 My pleasure to provide this recipe!